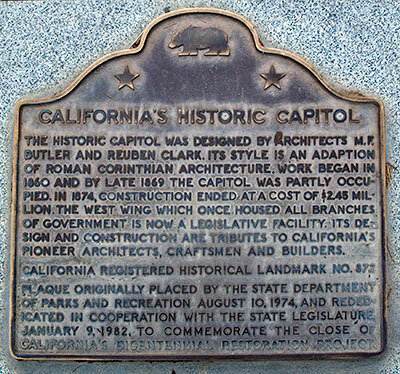 The historic Capitol was designed by architects M. F. Butler and Ruben Clark. Its style is an adaptation of Roman Corinthian architecture. Work began in 1860 and by late 1869 the Capitol was partly occupied. In 1874, construction ended at a cost of $2.45 million. The west wing which once housed all branches of government is now a legislative facility. Its design and construction are tributes to California's pioneer architects, craftsmen and builders. Plaque originally placed by the State Department of Parks and Recreation August 10, 1974, and rededicated in cooperation with the State Legislature, January 9, 1982, to commemorate the close of California's bicentennial restoration project. 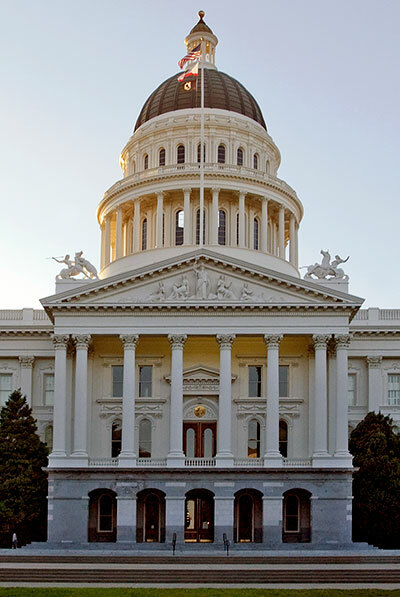 The State Capitol was added to the National Register of Historic Places in 1973 as listing #73000427.